The Obama administration is dismissing as “selective leaking” the leak to a Brazilian website of a letter from President Barack Obama to Brazilian President Luiz Inacio Lula da Silva setting out conditions for a possible Iranian fuel swap deal. 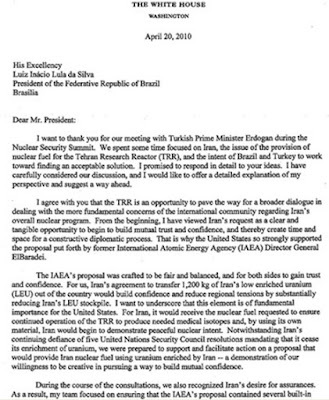 In the April 20 letter, which the White House did not dispute Obama sent, Obama thanks Brazilian President Lula for meeting with him and Turkish Prime Minister Recep Tayyip Erdogan on the sidelines of Obama’s Nuclear Security Summit about a possible confidence building measure with Iran. Under the deal, Iran would sent 1,200 kilograms of its low enriched uranium to Turkey, in exchange for Iran receiving in one year of highly enriched nuclear fuel cells that can be used to fuel the Tehran Research Reactor, to provide the country’s nuclear medicine. The United States accepted Arab demands to pressure Israel over its atomic program to rescue talks on shoring up a global anti-nuclear arms pact, Western envoys said on Friday. But they said Iran or Syria might still block a final declaration now agreed by most of the 190 signatories of the 1970 nuclear Non-Proliferation Treaty, who have been trying for a month to strengthen the troubled pact. Either or both could block the declaration because NPT meetings make decisions through consensus. If agreed, this would be the first deal at an NPT review meeting since 2000. "We have a deal that everyone can live with," a Western diplomat told Reuters. "Now the question, is will Iran do the right thing? Will they go against something the entire Arab League and everyone else here is ready to support?" Syrian delegates also refused to commit themselves to supporting the final declaration. WASHINGTON, May 3, 2010 – The United States released newly declassified details about its nuclear stockpile today, including significant progress made in dismantling warheads, in an effort to promote transparency and help stem nuclear proliferation. The United States had 5,113 warheads in its nuclear weapons stockpile as of Sept 3, a senior defense official told reporters today on background. That represents an 84 percent reduction from the end of fiscal 1967, when the U.S. nuclear arsenal was its largest, with 31,255 warheads, the official said. The current stockpile is 75 percent lower than when the Berlin Wall fell in late 1989, and the United States had 22,217 warheads. UNITED NATIONS -- Hopes were that the 2010 Nuclear Nonproliferation Treaty (NPT) review conference, which ends on May 28, would result in a resolution showing the strength of the global nonproliferation effort. But as the 189 treaty members mulled over a draft final declaration, it appears they might have to wait for the next treaty review in five years to move forward. The contentious draft pertains to the idea of how to achieve and ensure a nuclear-weapons-free Middle East, and calls for the UN secretary-general to organize a meeting of Middle East states in 2012 to sign on to the creation of a zone free of nuclear and other weapons of mass destruction (WMD). The National Human Rights Commission registered 2956 cases in connection with police encounters in different parts of the country, since its inception on the 12th October, 1993 till the 31st April, 2010. These include, 1590 cases registered on the basis of intimation received from the public authorities about encounter by the police, and 1366 cases registered on complaints received from public alleging fake encounter by police. A NHRC release dated May 21st, 2010 revealed. On consideration of various reports and material on record sought by the NHRC through its notices to the concerned public authorities and examination thereof, it was found that out of 1846 cases, 27 encounters by police were fake. 1819 cases were found to be of genuine encounter by police. Remaining 1110 cases of encounter/alleged fake encounter are at different stages of consideration in the Commission. Mani Shankar Aiyar on "Extremist Affected Areas"
Mani Shankar Aiyer on "Extremist Affected Areas"
The Cabinet Committee on Unique Identification Authority of India related issues (CC-UIDAI) today approved in principle the adoption of the approach outlined by Unique Identification Authority of India (UIDAI) for collection of demographic and biometric attributes of residents (face, all ten fingerprints and iris) for the UID project. It was also decided to include data of the iris for children in the age group of 5 to 15 years. The same standards and processes would be adhered to by the Registrar General of India for the National Population Register (NPR) exercise and all other Registrars in the UID system. The first set of UID numbers will be issued between August 2010 and February 2011. Thereafter, 600 million UID numbers will be issued in the next five years. Note: On 19th April, 2010, while speaking on the issue of Dantewada incident in the Rajya Sabha, P Chidambaramsaid, ""I think the gravity of the situation must be recognized, and I am willing to be advised, as I have been advised, if necessary, what cross-corrections we need to make, what fine-tuning we need to make. But there is no escape from the fact that the challenge has to be met squarely and fearlessly. It is a serious law and order problem. It is also a problem where we have to address the underlying socio-economic issues. " He added, "What is happening is, in Many States, tribals, villagers affected by Maoist activities are also setting up their own organizations. This is not to be confused with the controversial Salwa Judum. That is a controversial matter." Responding to Chidambaram's views, Nandini Sundar gave an interview to Rediff. Revised draft report prepared on April 01, 2010, for circulation among members of the Press Council of India. It was discussed at the Council's meeting on 26th April, 2010.